The red tanager (Piranga flava), also known as lowland hepatic-tanager, belongs to the family Cardinalidae. 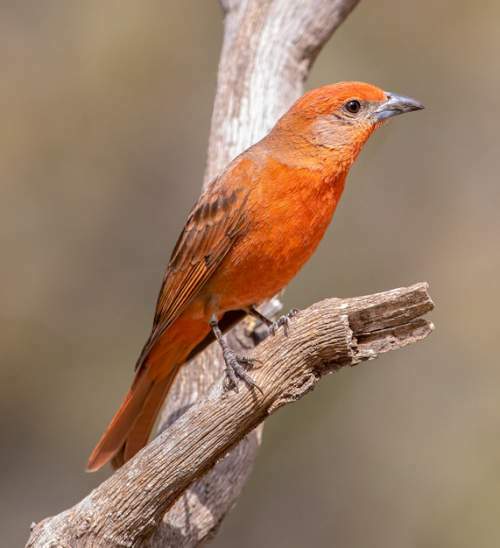 The red tanager is distributed over Argentina, Uruguay, Paraguay, Bolivia, Brazil, Guyana, French Guiana and Suriname in South America. These species were earlier classified under the family Thraupidae. These tanagers are polytypic species. The red tanager (Piranga flava) is a medium-sized tanager, measuring 18 to 20 cm in length and weighing 30 to 40 grams. The male red tanager has overall reddish orange plumage. The lower neck, upper back, flanks and wing-coverts are paler. The cheek is paler and striated. The female is olive green. The pale bluish bill is stout and sharp pointed. The legs are gray. The irises are blackish. There is a pale orange eye-ring. Their call is a repeated "tschip.. tschip.. tschip" sound. The red tanager is distributed in Argentina, Uruguay, Paraguay, Bolivia, Brazil, Guyana, French Guiana and Suriname in South America. The nominate subspecies P. f. flava is distributed in Uruguay, central and north Argentina, Paraguay and eastern Bolivia. The subspecies P. f. rosacea is distributed in eastern Bolivia. The subspecies P. f. macconnelli is distributed in southern Guyana, southern Suriname, French Guiana and northern Brazil. The subspecies P. f. saira is distributed in eastern and southern Brazil. The red tanager species have low forest dependence. They normally occurs in altitudes between 600 to 2000 meters. The artificial ecosystems and habitats of these species include heavily degraded forests. The natural ecosystems and habitats of these species include tropical and subtropical moist lowland forests, tropical and subtropical moist montane forests, deciduous forests, mangrove forests and dry savanna. The diet of these red tanager species consists mainly of insects. Larval insects, insects, moths, caterpillars, grasshoppers, spiders, fruits, berries and figs are their primary food. They mostly forage for insects in the middle and lower canopy. They occasionally descent to the floor to feed on insects and fallen berries. The breeding season of these species is during November in Brazil and during October in Paraguay. These birds are monogamous and nest solitarily. 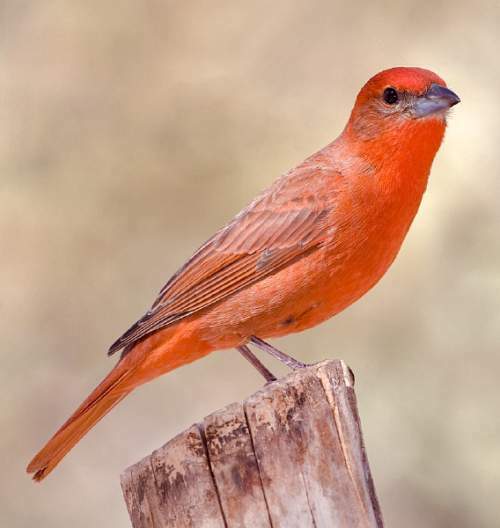 These tanager species are non-migratory, resident birds. The breeding populations in the southern range appear to make short-distance northwards movements. The global population size of the red tanager (Piranga flava) has not been quantified. The overall population trend of the species is not known. In most of its range, this species is reported to be common to locally common. The generation length is 4.1 years. Its distribution size is about 9,510,000 sq.km. Ecosystem degradation, ecosystem conversion, agricultural expansion and trapping of juveniles and adults for pet-trade are the main threats that may endanger the survival of the tanager species. The red tanager (Piranga flava) species does not approach the thresholds for being Vulnerable either under the range size criterion, or under the population trend criterion or under the population size criterion. The CITES (Convention on International Trade in Endangered Species of Wild Fauna and Flora) status is ‘Not Evaluated’ for the red tanager (Piranga flava). The red tanager (Piranga flava) is closely related to the hepatic tanager (Piranga hepatica). P. f. saira (Spix, 1825). 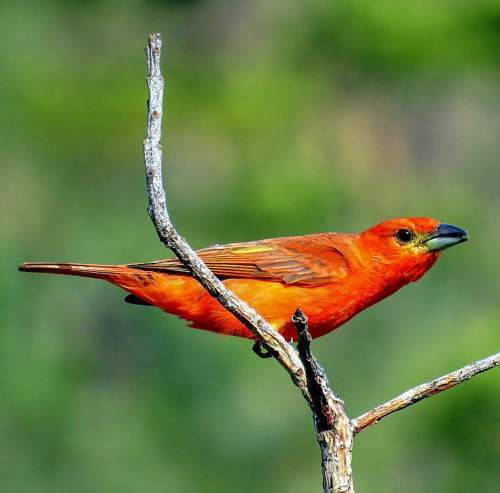 Recently updated and current topic in Bird World: Red tanager - Piranga flava.